This week was really good we did a ton of work! We found a lot of great people too. This Monday we found the mother of a less active Young man and her and her neighbor are now taking the lessons and we have a lesson with them in an hour from now. Also we have this other lady that we talked with Monday night that you could just see the hunger as we talked to her about the church and the Book of Mormon and such. We won't be teaching her for a while for her work and such but we'll see how it goes with her. We're going to have to go by and invite her to General Conference. We also have someone who actually has a date set to get baptized. It's a great story. First off all of the stores in Argentina to buy food in are really small corner shops type of thing so we have four within about 2 blocks of us. All of them except one were closed a little while ago because of vacations but the one that was open we went to buy some food and after we had bought the food the lady at the counter said, "Elder". Our ears kind of perked up like a dog that hears a whistle and she says, "What does my son have to do to get baptized?" We'll we told her that we would like to come back when she was available and tell her all about it. So a little while later we do that. The son, Ivan is his name, comes to church and now he's going to be getting baptized the 10th of April. His mother Lidia isn't married and for that reason alone isn't already baptized so we're trying to work with her on that. They're also going to come to conference this weekend too. Speaking of which I'm so excited for! We have it here at 1 in the afternoon and at 5 and priesthood at 9. So kind of late but I'm really excited to go and bring a lot of people too! Well everyone enjoy conference. It's the most wonderful time of the year hahaha. It's really something amazing to have a living prophet, a living church. We enjoy so many blessings that others just don't have in their lives. Conference is one of the best ways to find out what we need to do to avoid a lot of heartache and misery by following what the prophet and apostles say! Well have a great week chou! NOTE: DUE TO THE SHORTAGE OF TIME AND THE PERSONAL NATURE OF THIS WEEKS EMAIL THERE WILL BE NO BLOG ENTRY FROM ELDER SANDS THIS WEEK. As so many have reminded me, I have arrived at my hump day, well tomorrow really, but some have asked me to put together some thoughts of sorts about this year down here in Argentina. Well as all missionaries will say, I've loved it, although some of it wasn't exactly the easiest, still I have enjoyed it all. A mission is something very unique. We have all types of experiences; it's really like a roller coaster. We involve ourselves so much in what we do, and in who we talk with, that we really forget about ourselves. When that happens, we see the miracles in the work. I've seen many miracles in the course of my mission and I know the best is still in store. I don't know exactly how, but I know I'm a better person than I was when I left. I can tell I'm doing more, I feel the spirit more and I wish I could show you all everything that's been happening. There are so many people here that need the gospel and when someone who was looking for it finally finds it, or someone who didn't know they were looking for it finds it, it's the best. You see the hope in their eyes and the spirit touches their hearts. So now for the other half of my mission. I sincere hope is to use everything I've learned and apply it all to what I'm doing. I hope to help every person I can and every person that will let me. Thank you all so much for your support and your love. I know Heavenly Father loves us and he wants the very very best for us. For that reason he sent his son to suffer for us so that we might one day live with him again. Jesus Christ is the Son of God and he loves us more than we can even imagine. The book of Mormon is the word of God. I know that for myself because of the things the spirit tells me when I read it. It really does contain the fullness of the gospel and when we abide by its precepts we really do come closer to God. Joseph Smith was a prophet of God sent by him to restore his church upon the earth and to translate the Book of Mormon. We now have a prophet, Thomas S. Monson, who leads and guides this church under the direct direction of the Savior. I know all of this without a doubt and that's why I'm out here; helping the people of Argentina come to that same knowledge. Thank you all again for your love and support! NOTE: 13 NEW PICTURES THIS WEEK! CLICK ON THE PICTURES TO THE RIGHT TO VIEW THE PICTURE ALBUM. It's amazing what the Lord will do for his servants. I read a letter sent by the wife of the mission President of the Santiago East Mission. Just incredible! Many good principles. Well transfers happened and I'm still here in independencia Olavarría so I'll have been here for six months. My companion is Elder McGahan from Utah. It's always a little weird to get a new companion. Everyone is so different and have different ways of doing things. It's always a bit of a challenge to change like that because you get comfortable with the same things but that isn't always good for the work. I'm excited to try and work in a different ways this transfer. We'll see how it goes. As for investigators, same old story. People go to church that don't want to get baptized and all those that want to get baptized don't go to church. However, some people's schedules should be a little bit more open right now so we'll see if we can't try to see if there's anything with them now. We're going to be trying a lot of new ideas this transfer so I'll tell you all how it goes. Have a great week and I have a challenge for you all; talk to someone who's not a member or who doesn't go, about the blessings they can receive from listening to the missionaries or going to church. You'll be doing them and yourselves a huge favor! To start off I don't think I ever answered the question of Kayte Marx. The mission is really the best two years of my life even though I don't haven't been out two years yet. I love it! It's not the easiest nor the funniest but it is the best, absolutely! Also to Sister Jones, I just got your letters from January and February and thanks and yes my companion is a really hard worker. In fact he has gone through 6 pairs of shoes. I don't have such bad luck as I'm still on my first but they are a little worn out. My mission president said something wise, that to measure the success of a missionary is to see where he and the ones he's baptized are spiritually ten years after the mission. So I won't really know for a while just how successful I am, but I'm working on everything I can so that I can say, according to this measure, that I was a successful missionary. This week, well I'm not going to lie, it could have been better. It was a lot of bad timing and not being in the area. That never helps of course but we're hoping we can get people to church. That is really the only hard part for these people. There are tons of people who we can teach and they'll know that the Book of Mormon and the Church are true but they still won't want to go. If it weren't for that, half of Argentina would already be members, but that's the challenge. As for investigadores well that are coming to church we don't have anyone that isn't waiting for something. One family, flia Villar, still needs to be taught a lot and the others need to get married and another is waiting for a brother to get back on track so he can baptize her or just doesn't want to. That's really it right now. We'll really have to start over with new people next week. As for the earthquake in Chile, well nothing here happened. I guess going across the country of Chile, across the Andes and then going another 700 miles was just too far the effects to be felt. But there are a couple of missionaries in my zone that their families that were greatly affected. And we do however have two chilanos and one of her family lost everything and she was saying everything! That's sad but everyone here is fine. Oh transfers, I'll find out what happens this Friday so we'll see who my comp will be and or if I go. Letters would be greatly appreciated by Elder Sands during his mission. 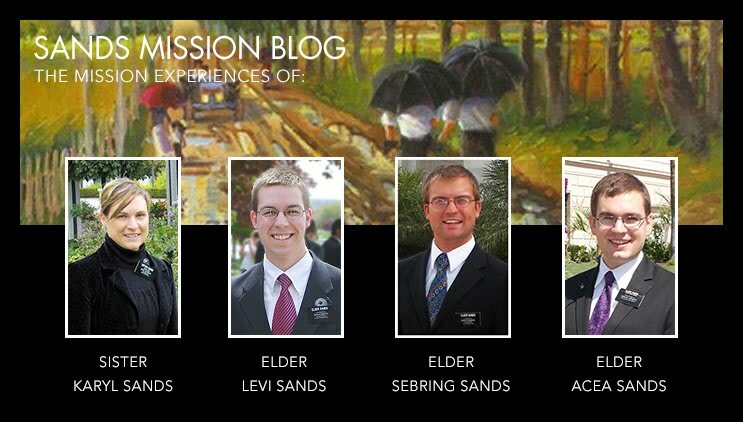 This blog contains the mission experiences of Elder Acea Sands who is serving in the Arizona Scottsdale Mission from January 14, 2015, Elder Sebring Sands who served in the Brazil Campinas Mission from March 30, 2011 - March 19, 2013, Elder Levi Sands who served in the Argentina Bahía Blanca Mission from March 18, 2009 - March 23, 2011 and Sister Karyl Sands who served in the Germany Frankfurt Mission from June 14, 2006 - November 23, 2007. They serve these missions for the Savior Jesus Christ and The Church of Jesus Christ of Latter-day Saints.